How do you bring your health and beauty products to the forefront of your customers’ mind? As the cosmetics industry continues to grow, products must be showcased for consumers with inventory kept readily available for sale. According to Statista, the skin care segment alone is anticipated to grow by $20.1 billion between 2014 and 2019. To meet this growing demand, brands must own their shelf space. The cosmetics industry often relies on product and merchandising appearance, so displays should be elegant and brand congruent. It’s imperative that your eye-catching display endures the wear-and-tear of customer handling. Tusco offers an extensive range of design options for cosmetics displays. Our nimble, in-house approach to both design and manufacturing maximizes the creativity we can build into cosmetic displays. Our years of custom display experience give us a strategic edge during the design and engineering process to arrive at solutions that work best for your products. To support your ideation, here's an overview of some commonly used forms for cosmetic displays. Here, we illustrate four display types that are common in retail cosmetics, although any of these can be custom fit to accommodate specific spaces. Counter-top displays are among the most high-traffic, and they are used to show off similar, small-size products that come in different styles or colors. Nail polish and lipsticks are frequently showcased on this type of display. Display gondolas are larger pieces, often placed on top of a counter or table and used to lay out many same-brand products together in a clear, enticing way. End-cap displays are used to flag quick-grab deals and small products or packages. Retail counter displays -- which are the largest displays of these four -- create a space for cosmetics professionals to work with and directly assist customers. They provide the clearest space for brand interaction and engagement, and they often have the most elaborate incorporation of design elements. You can see more images of displays like these in our gallery. 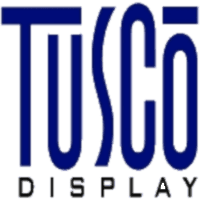 At Tusco, we are well-versed in the best practices for implementing these displays to meet your sales needs. We factor into consideration every special detail. From the lighting in the destination to electrical access and all the way down to cleaning, moving and storing the displays. Our professionals are on-hand to understand your design goals and to work with you as we design the ideal solution for your custom display needs. To learn more about custom cosmetic displays, get in touch by calling us at 740-206-8298 or submit our online form.